-You can use the ticket for more than 250 stations with 13 lines of Tokyo Metro and Toei Subway Lines. 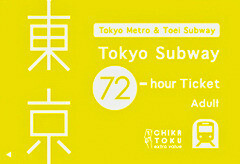 Please refer to the Tokyo Metro Map.This card is valid for 72 hours after the activation. *The ticket is valid for 72 hours after first use within the expiry date stated on the back of the ticket.